I wake up after another one of those interval naps but there’s still three hours to my destination… just enough time to squeeze in one more movie, The Iron Lady. I can’t believe that even this film reduces me to tears, Maggie Thatcher might be as hard as nails but I ain’t no iron lady. This voyage has played hazard with my tear ducts and ruined a lot of eyeliner! Finally, we touchdown in the mother country! Hooray, I’m at Heathrow. It seems as though I’ve brought the sunshine with me, shame I can’t manage the mercury too – it’s pretty chilly! There’s an anxious period by the baggage carousel while I wait what seems like an eternity for my luggage to arrive… I’m thinking that even the worst case scenario is a best case scenario for this one – if my case gets lost, the insurance will pay me to go shopping! I have to put the retail fantasies on hold when my case finally shows up and I rush off to find my ride. My lovely auntie Sandra has come to pick me up and I’m experiencing double the amount of excitement because a) I am sooo looking forward to seeing her and b) it’s such a treat to get a chauffeur ride wee wee wee all the way home! It only takes me a minute to locate her and then we’re off and away for a brilliant breakfast. But first, we stop at the deli for some of the bestest bagels North London has to offer, and a big pickle. I have an unhealthy addiction to big pickles and am unable to resist. I buy the biggest one in the shop and it’s down the hatch before we even get in the car! I’ve blogged before abut my auntie’s food which is truly the stuff food legends are made of. Auntie Sandra is a superwoman and has gathered all my favourite foods together for this regal repast. 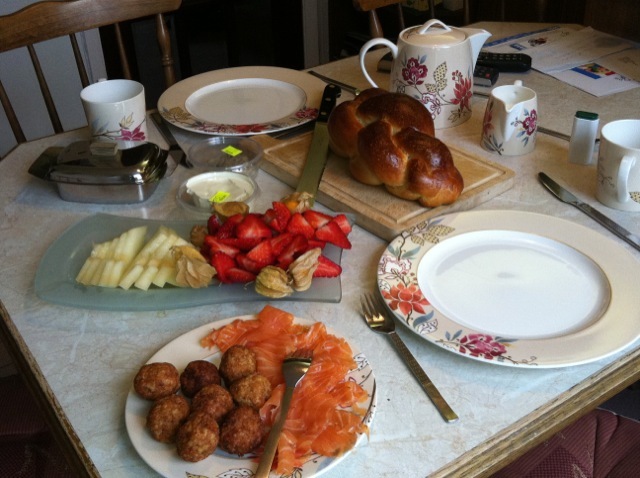 There are bagels, challah (sweet bread a bit like brioche) smoked salmon, cream cheese, chopped herring, fish balls and a platter of fresh fruit. It looks like food heaven just fell out of the sky and landed on the table. It’s like a breakfast degustation – only better! I’m starting my holiday as I mean to go on. The morning passes quickly and after a good old auntie-niece gossip and lots of cups of tea, Sandra and Malcolm head off to their previous engagement and I scrub up after my never-ending journey. I venture out into the sunshine for a wee walk and an adventure to the local supermarket. Wowee zowee – everything is so cheap in England. It’s an effort to keep my mouth closed because it keeps hanging open in amazement at the ridiculously low prices. It all looks very tempting, even though I don’t need anything. After wandering in amazement up and down the aisles, I quit while I’m ahead and make a hasty retreat with just a few essential items in my bag! When Sandra and Malcolm get home, the catching up continues. All my family in London call me Mandy – don’t ask me why – that’s what they’ve always called me, ever since I was born – it’s a bit weird, like having a dual identity! David always says that when we’re all together, he should be able to change his name too, just for the fun of it! They’ve tried calling me Sam but that doesn’t work either, it just ends up confusing all of us even more! Anyways, while we talk, Sandra texts her daughter-in-law to tell her she’s with me and Lucy. She wants to say, “sitting chatting with Lucy and Mandy” but what she actually types is “battering with Lucy and manfully.” Did I tell you that while my auntie might be Queen of the Kitchen, she sure isn’t Top of the Texters! After some big belly laughs, we feast on Sandra’s Champion Chicken Soup and that’s just about when my jetlag kicks in with a vengeance. I can hardly keep my eyes open! But I do. Just long enough to ride with Sandra and drop Lucy home and then I come home, crash out and drop off into a very sweet sleep.